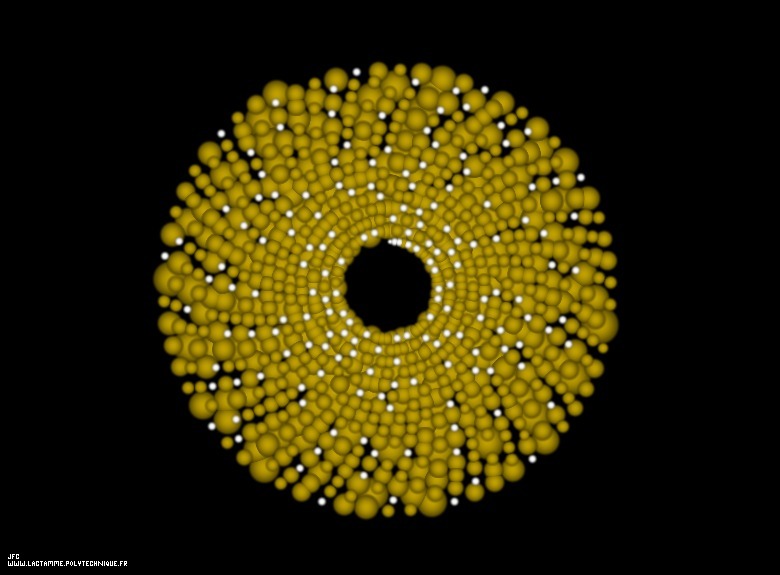 An Archimedes spiral displaying 1000 numbers [Une spirale d'Archimède montrant 1000 nombres entiers]. Starting from the center of the picture, the spheres are numbered (1, 2, 3,...) when following an Archimedes spiral. The radius of the N-th sphere is proportional to the square root of the number of divisors of N. The number 1 and the prime numbers are visualized by means of white spheres (a smaller one for the number 1). See the dynamics of a variable Archimedes spiral. Copyright (c) Jean-François Colonna, 1999-2015. Copyright (c) France Telecom R&D and CMAP (Centre de Mathématiques APpliquées) UMR CNRS 7641 / Ecole Polytechnique, 1999-2015.